Hawaii Native Status: Introduced. This naturalized weed is native to Mexico and Central and South America. Description: The flowers are small and have 5 white, hairless petals. 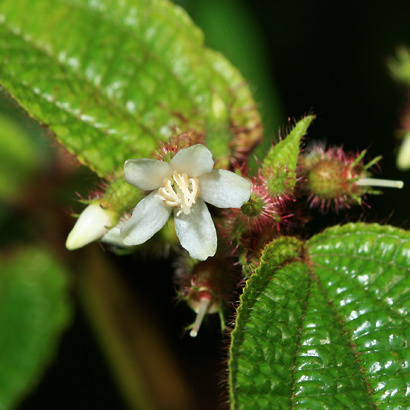 The flowers are followed by hairy, rounded, 1/3 inch (9 mm) long, green ripening to dark purple berries. 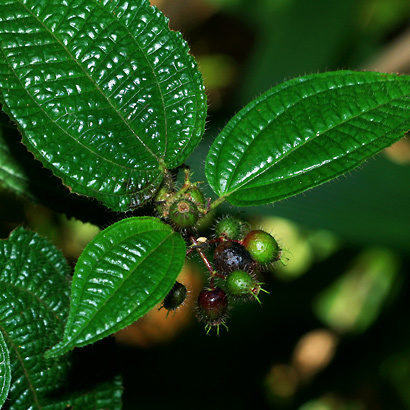 The leaves have 5 recessed longitudinal veins, hairy, finely round-toothed margins, and are shiny, bright green to dark green, bristly hairy, opposite, broadly to narrowly egg-shaped, and deeply quilted with small, depressed, transverse veins. The plants are covered with small, needle-sharp, bristly hairs that can penetrate the skin and cause irritation, so beware of handling or walking through these plants. 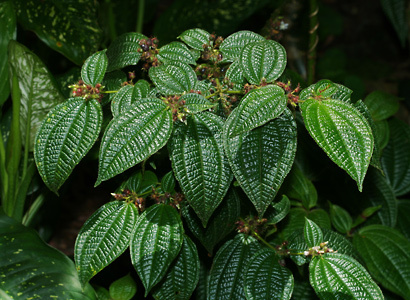 Here in Hawaii, Koster's Curse is an aggressively invasive weed in sunny to shady, wet to mesic (moderately wet) pastures, forests, and forest edges at lower elevations. The plants are thicket-forming and will crowd out native plants. Birds enjoy the sweet, fleshy berries and are responsible for spreading the seeds.